In an election year, even conservatives supporting John Howard, are subject to shifting grounds: refugees may be OK after all! It's January 2004, the year of the next Federal election after John Howard's 2001 Tampa 'dark victory'. Slowly, hesitantly, a quiet chorus of Liberal and National backbenchers are whispering that refugees are good for Australia, good for the economy, and good for many things. Lesser known names now appear in local newspapers and speak out on small radio stations. John Forrest, Petro Georgiou and Patrick Secker, while Kay Hull also joins the fray. Seven news items on this page bear witness to Liberal and National party MPs who are now on the record, calling out refugee issues as relevant during the election campaign. Click the links below to jump down the page to the articles! More and more MPs on both sides of politics are prepared to let asylum seekers stay in Australia. It's not so much about bleeding hearts as economic reality. Mike Seccombe reports. John Forrest, MP, doesn't argue for compassion for the thousands of Afghan and Iraqi refugees who have settled in his electorate. Instead, the Nation als' plain-spoken member for Mallee in rural northern Victoria argues in terms governments understand: economics. "They're a resource," he says. "Someone accused me of being mercenary, for looking at them as a resource. Whatever works, mate ... I'm not a bleeding heart, but they are making an economic contribution out here where I live." Last month Forrest argued in the Coalition party room that refugees whose three-year temporary protection visas (TPVs) are running out should be allowed stay here. It surprised a lot of people, including moderate Liberals, but it probably shouldn't have. Wave after wave of immigrants to Australia have proved that experience begets understanding - and Forrest and his constituents have had plenty of experience. "They're highly qualified people, many of them," he says. "These are the intelligentsia who those regimes were after, a mixture of Afghanistan, Iran and Iraq. The ones that had a bit of education [and] got a bit critical ..." He cites the orange picker who is a qualified dentist and the physiotherapist who now works in the local hospital. "I've got engineers, I've got doctors. I think the tea leaves are shifting a little as people meet them and find they're not the demons that they thought ..."
Forrest offers no comment on how these people - who fled to Australia to escape persecution by oppressive regimes with which Australia subsequently went to war - came to be demonised. But that is only politic. It was his colleagues who branded them queue jumpers, illegals, criminals, potential spreaders of disease, possible terrorists. It was his government which spread the myth that these asylum seekers had thrown their children into the sea, his Prime Minister who declared: "Quite frankly, I don't want [such people] in this country." JAFAR al Khateeb was already in Australia when John Howard said that. He had taken part in the 1991 uprising against Saddam Hussein; his father and brothers had been killed when it failed. He and his family fled to Iran. In 1999 they decided to try to get to Australia, and he went first. His boat was intercepted and, after 10 months in the Curtin detention centre, he was found to be a genuine refugee and released on a TPV. But his wife and four children came after the "Pacific Solution", and were sent to Nauru. They could not claim to be in genuine fear of persecution just because he had been determined to be genuine. So it took nine months before they, too, could establish their refugee status and come to Australia. During that time, "there was not any connection between him and his family ... in Nauru. He has not any idea where they are," relays the interpreter as the Herald interviews the family, now in Shepparton. June 18, 2002, was, says al Khateeb, a day "happy, but sad, too". The family was reunited, but his wife had sunk into depression. His seven-year-old son's eyesight had deteriorated badly, his three-year-old daughter had become sickly and withdrawn. "Nauru was terrible, very hot, no water, no electricity, no cooling, even cooking was very dirty." When it rained, the water was knee deep in the canteen. "Many people lost their minds in Nauru." The family still bears its scars, but things are much better. They have a house, the elder sons, Ahmad and Faisal, 22 and 21, are studying English and work for SPC, the canned fruit company. But any long-term planning is impossible because they don't know if they will be allowed to stay. ACCORDING to Immigration Department figures, 8885 people are in the same position. Among them are 3606 who have reached the expiry on their temporary visas, but have been allowed to stay, pending a decision on applications for further protection. Of 604 cases decided, only 27 have been granted permanent protection, while 535 have been refused and 42 applications have been withdrawn. By the middle of next year almost all TPVs will have expired, leaving their holders in limbo. The quoted figures include children born in Australia. Aadam al Musawi, 10 months, is one. But the other al Musawi children - Zainab, 11, Sadiq, 6, and Douaa, 5 - are equally stateless. Their father, Jafaa, and mother, Rajaa, fled Iraq after the failed 1991 uprising, and the children were born in Iran. The two girls say they want to be teachers; Sadiq wants to drive bulldozers. They sound as Australian as any other kids their age, yet the Government could still send them "home" to a country they've seen only in pictures - mostly of conflict. The TPV system assumes that while these people have a genuine claim to short-term protection, the day will come when it is safe for them to be sent back to their country of origin. But how do you assess the risks? How long do you continue to treat refugees as temporary residents before you accept they should be allowed to stay? And if the Government relented, would the whole boat people thing start again? These are big issues for the Howard Government, as John Forrest acknowledges. Clearly Iraq, with rampant crime and almost daily acts of terrorism, is not safe, and the security situation in Afghanistan is deteriorating. In any case, neither country will accept forced returns. Even in the Government, many are asking whether you can send refugees back to a country deemed so dangerous that Australians are warned against going there. Afghans and Iraqis could be on rolling protection visas for years - even decades - to come. There is a growing if unlikely alliance between the predominantly urban small "l" liberal stream in the Coalition (like Marise Payne, Petro Georgiou and Bruce Baird) and the pragmatic rural conservatives (like Forrest, Kay Hull and Sharman Stone) who want TPV holders to be better treated. For reasons either humanitarian, utilitarian, or both, they want TPV holders assured they will not be sent back to war or persecution, and given some prospect of a long-term future in Australia. These are big questions, too, for the Opposition, and the first real test of Mark Latham's leadership will be negotiating answers at Labor's national conference this month. There will be a concerted push by the Left, with the support of the rank and file, for Labor to place a time limit on TPVs. By the end of the conference, Labor policy will likely stipulate that if conditions in a refugee's home country have not improved after a relatively short time, the refugee should be granted permanent protection here. He or she could then go on to take out full citizenship, subject to the conditions which apply to other migrants. The waiting period could be a year or three years - likely two. Whatever, refugees will have some kind of certainty. "The thing everyone agrees on," says the Left MP Tanya Plibersek, "is that the rolling TPV regime cannot go on, where you never, ever can become a permanent resident, never a citizen, never get a passport or leave the country, never see your family, no matter what." IT IS THE uncertainty, more than anything else, which drives TPV holders to despair. Kazim A Kaabi arrived in May 1999, having spent eight years in Iran and 15 days on a rickety boat from Indonesia with 350 others. Now he lives in a small, barely furnished flat in Shepparton, the saddest of the people we meet. His wife, Zahra, and family still are in Indonesia; he has been waiting about three years for the Government, through the United Nations, to help. He shows us what he has been given in lieu: various medications, including sleeping pills, prescribed to help with the anxiety. "She is also an old woman and she's very sick," he says, through the interpreter. "I just hope I will get to see my wife." He also shows us a letter from the manager of the local St Vincent de Paul centre noting how he came for assistance, then came back as a volunteer. "He has committed many hours to unpaid service to the society and ... is an amiable and genuine man very keen to assimilate," it says. Under the current TPV regime, however, no matter how keen a refugee like A Kaabi is to assimilate, and no matter how much money government spends providing language, housing, medical and other services to help, in the end all the hope and money must be wasted. For more than 20 years, Khalid Al Sharifi, 30, lived in a society in chaos. He was eight when Iraq went to war with Iran. Then came the first Gulf War, sanctions, and all the while Saddam's despotism. "When you're young and you grow up with ... all these horrible things, you don't believe peace will come," he says. "It becomes your psychology. I do not believe Iraq will become a peace country for a long time." He gave up on Iraq in 1999. Now he studies English, works in a factory, has a Turkish-Australian girlfriend and plays soccer. The former first division goalie has helped his team win the Victorian country cup three years in a row. Although he tries to be optimistic about fitting in, there are times when the uncertainty of his status gets him down. "It makes it not just hard, but confused, too. You go to college to learn English, you think what you want to be [and then] you think you might not have a future here ..."
"My [football] team, lots of people are good to me. People in the street are different to the Government." JOHN Forrest, given his large experience with the TPV holders, is sure most are worthy of being allowed to stay. "I think the kind of people who've got the guts to do what they've done are the kind ... the nation needs." It sounds like heresy to suggest, in John Howard's Australia, that if asylum seekers can successfully run the gauntlet of getting here, they should be entitled to stay. But many on the political right of politics are coming to that view. Gerard Henderson, in this paper recently, said: "There should be room for a policy which is tough in sending the required message to criminally inclined people smugglers while exhibiting greater empathy to whose who make it to Australian shores". Others who would normally be considered ideological fellow travellers with the Government are even more radical: right-wing globalists who see the intellectual inconsistency in endorsing free movement of capital and goods, but not people. Howard's good buddy, George Bush, for example, has floated the idea of changing US immigration law to allow 11 million illegal immigrants to pay a fine ($US1000) and apply for citizenship. And most are not bona fide refugees, but economic migrants from Latin America. Like Forrest, Bush is looking at economics and social reality, not the politics of the situation. Night-time in Shepparton, and a few dozen refugees have gathered for prayer, not in a mosque but in the Uniting Church hall. The inscription on the hall's foundation stone says: "To the glory of God in the teaching of little children." Outside children race around happily, oblivious to the oddity of their surroundings. Oblivious also to the lesson the Government's policy seeks to inculcate - that they have no future here. Outside the safe seats, what are voters talking about, asks Michelle Grattan. In Darwin last weekend to open the long-awaited railway from Alice Springs, John Howard asked local federal MP David Tollner what were the issues in his seat of Solomon. Well, Tollner said, one was the idea of crocodile safaris. The Federal Government should not object to a proposal to provide crocodiles for paying "hunters", Tollner told the PM. When you are sitting on 0.1 per cent, the "crocodile" vote apparently can't be ignored. Tollner holds the most marginal Coalition seat in Australia. The Country Liberal Party member is one of an 11-person club: if all these members, on margins ranging up to 1.7 per cent, were defeated the Coalition would be in opposition. Howard talks about a loss of eight seats wiping out the Government but 11 is a more accurate figure (after the redistribution and making some assumptions about the independents). With local and regional swings always variable, an across-the-board 1.7 per cent wouldn't necessarily knock out all these seats; and others, on bigger percentages, could be more vulnerable. But, as the PM prepares to crisscross the country in coming months to defend his marginal members, the composition of these 11 frontline seats and their incumbents' readings are instructive. Only one is in Victoria (Deakin, in the eastern suburbs). Five are in NSW but all but Parramatta are outside Mark Latham's western suburbs domain. The other NSW seats have strong regional components: Dobell takes in the central coast; Richmond is on the north coast, Paterson is in the Hunter, and Eden-Monaro is based on Queanbeyan and takes in the south-east corner of the state. There are two metropolitan South Australian seats (Adelaide and Hindmarsh), one outer metropolitan/rural Western Australian electorate (Canning), and the Queensland regional seat of Herbert, based on Townsville. National stories dominate the media, but in modern elections local campaigns are also crucial. When you talk to marginal members, their conversation quickly slips back to what's close to home. If you'd tapped the mood of marginal members at the start of 2001, you'd have found deep panic. This year, there is nothing like that alarm, although they're alert to risk. Larry Anthony, the only National, finds Richmond (1.7 per cent) "benign". No single issue is coming through - in contrast to 2001 when the GST on caravan park rentals nearly killed him. He mentions health and interest rates as sensitive, and, important in a seat with many retirees, the Minister for Children notes that "seniors like to be acknowledged and recognised". Bob Baldwin in Paterson (1.5 per cent) says people are concerned that interest rates have started to move up, and warns there is a genuine threat Labor could take government. A number of these MPs say voters are interested in Latham, but are in "wait and see" mode. Peter Lindsay (Herbert, 1.5 per cent), finds that while there are deep suspicions about Latham's record, "the electorate has not written Latham off by any means, and the next election will be very tough for the Howard Government". In general, the MPs say the Howard-Latham "generation gap" is not being raised, although one, who prefers not to be named, says "it comes up a bit with younger people". Interestingly, asked what issues voters were raising and what the Government should be doing, the words "tax cuts" crossed nobody's lips. Health is clearly big in the marginals. "I need more doctors - I believe that's being addressed by (Health Minister) Tony Abbott," says Canning's Don Randall (0.4 per cent). Ken Ticehurst, in Dobell (0.4 per cent) wants action speeded up as much as possible. "We've got to get more GPs into my area. This is a huge problem. Bulk-billing rates are irrelevant - it's access to services. There are lots of immigrant doctors. They need to be fast tracked" to become qualified. Federal members are finding voters deliberately or unconsciously blurring federal-state lines. "Most of the issues that tend to get raised are state issues - the hospital system is in turmoil in NSW. Certainly roads are an issue but 99 per cent of roads in my electorate are state or local. People tend not to differentiate," says Gary Nairn in Eden-Monaro (1.7 per cent). Lindsay is so frustrated by the merging in the public mind of federal and state responsibilities for health that he'd like to see the Howard Government "take over all health services - including public hospitals - and take the state governments out of the loop". The marginal members talk about the economy, employment growth, and security as pluses for the Government. Some mention border protection but from a minority there is concern about perceptions. Phil Barresi (Deakin, 1.6 per cent) says that "one of the criticisms sometimes levelled at us is that we pursue an agenda without a social conscience, for example on border control. That image and perception need to be combated". Parliamentary secretary Trish Worth finds a lot more sympathy for asylum seekers in Adelaide (0.6 per cent) than in regional areas, but she's not advocating a change of policy because "so many genuine refugees who wait patiently deserve to be considered first". But Chris Gallus, also a parliamentary secretary, says the Government's refugee policy plays well in neigbouring Hindmarsh (1 per cent), which is a "very pro-Howard" electorate. Parliamentary secretary Ross Cameron (Parramatta, 1.2 per cent) sees the need for a better Government selling effort. "Often we're not being sufficiently good at marketing our strengths. We've got to focus on communicating clearly what the Government's done and what its plans are for going forward." Gallus thinks the Government needs to better explain the benefits of an Australian-American Free Trade Agreement. Barresi points to the hazard that confronts a government seeking a fourth term. "Some electors will say the Government's done a great job but that it's time for a change. That's the biggest danger I face as an individual and the Government faces. It has to show we still have an agenda that responds to the community and I have to show I value add - my motto is making a difference," he says. The Howard Government is under increasing pressure from its MPs to show more compassion to refugees in Australia on temporary protection visas. At yesterday's meeting of coalition MPs in Canberra, two Liberal backbenchers, Petro Georgiou and Patrick Secker, told Prime Minister John Howard that the Government should show more compassion to the refugees. The three-year visas give sanctuary to refugees fleeing violence in their own countries until the situation at home is judged to have improved enough to enable them to return safely. If the situation does not improve, the best these refugees can hope for is a succession of three-year TPVs. Last week National MP Kay Hull called for an amnesty to allow those on temporary protection visas to settle permanently in Australia. Mrs Hull said such refugees should be allowed to stay as long as they settled in regional and rural areas and did not have criminal backgrounds. Nationals whip John Forrest has also urged the Government to soften its treatment of TPV holders. He favours Labor's policy of giving permanent residency to all those who have been on TPVs for two years. THE situation facing Afghani refugees living in Murray Bridge was raised with Immigration Minister Amanda Vanstone and in the party room with the Prime Minister John Howard in Federal Parliament this week. Member for Barker Patrick Secker raised the issues as part of his commitment to help the refugees gain permanent residency in Australia. Mr Secker said he was doing everything on an individual basis and had taken the issues up with Senator Vanstone and was working them through with her. "I have asked for her help because we have two fairly urgent issues which need to be resolved as quickly as possible," he said. In parliament yesterday Mr Secker won the support of one member, who also spoke about the refugee situation, and other members approached him in private afterward saying they were "pleased" he had raised the issue. "I don't want to raise expectations (for refugees), just to say I am working through it all and trying to get some certainty for them and the issues resolved," he said. "I am hopeful the Minister will look upon the situation favorably, but I can't make a decision, just try my best and do what I can." THERE may be light at the end of the tunnel for Murray Bridge's Afghani refugees following a groundbreaking meeting with Federal Member for Barker Patrick Secker on Sunday. Mr Secker was confronted with harrowing stories of the plight of about 50 men, influencing him to speak with the Immigration Minister Amanda Vanstone yesterday and Prime Minister John Howard in the party room today. Endeavoring to speak with each refugee in the short 90-minute space of time he had available, Mr Secker said he felt the men had proven themselves as worthwhile members of the community. "I heard stories of how they got out here, why they came, what happened to their families, what will happen if they go back, how it has been since they have lived here and the problems they have faced here," he said. "I put it as a heartfelt experience in that that they really did have some serious problems and haven't the certainty in their life as everyone else does. "There were some pretty sad stories there." Mr Secker said he would ask for compassion from all Australians for the refugees, because they were "deserving" of it. "They are all on temporary protection visas and at this stage they are all running out or getting close to," he said. Learning the refugees were from a persecuted ethnic group and it was not safe for them to go back, Mr Secker said these were "good people" and he wanted them to stay. "These men haven't taken any jobs away (at T and R Pastoral), there are still jobs there and they (company directors) need more people there," he said. "They are doing jobs no-one has been able to get locals to do." Refugee Support Group advocate Leta Padman said Mr Secker and his wife Sharon took copious notes from the men and were "very interested and sympathetic". "We are still a long, long way from finding a solution because these men are running out of time," she said. "Two men have been given 28 days, a lot have had interviews for extensions of their visas, but this is still a terribly worrying time." The Government's hard line towards refugees on temporary protection visas came under new pressure yesterday, with the Nationals' Kay Hull urging an amnesty to allow them as well as visa overstayers to settle permanently. Mrs Hull, who holds the NSW federal seat of Riverina, said these people should be permitted to remain, provided they settled in regional and rural areas and did not have criminal backgrounds. Nationals whip John Forrest is campaigning for the Government to adopt a softer line to TPV holders. He also recently praised Labor's new policy, which would enable all those now in Australia who have been on TPVs for two years to settle. The Government's policy is to repatriate people judged no longer in need of protection when their three-year visas come up for renewal. People on visas that were issued after a cut-off date, who are still judged in need of protection, can only get another TPV. The stands of Mr Forrest and Mrs Hull undermine the attempt by Prime Minister John Howard to paint Labor's policy as dangerous, and a magnet for fresh loads of boat people. Mrs Hull has written to the Immigration Minister Amanda Vanstone proposing the amnesty. Some in her electorate were overstayers who had joined in long-running class actions. They were not supposed to work and were a drain on local charities. Those on TPVs had filled a gap in the work force, Mrs Hull said. There was a labour shortage in the fruit and vegetable-growing areas in her electorate. "It is not a matter of taking Australians' jobs - Australians are not doing these jobs." She said the TPV holders had proved a valuable resource to employers and did jobs others did not want to do. "Australians have always welcomed refugees, but they want to know the people they are welcoming don't have criminal records." Mrs Hull's letter to Senator Vanstone was sparked by a Government announcement last month that from July 1 qualified people who want to come to Australia as skilled migrants will be able to get a three-year temporary residents' visa if they commit to living and working in regional Australia. They will be able to apply for permanent residency after two years. Mrs Hull said the pressing need in her area was for unskilled workers. 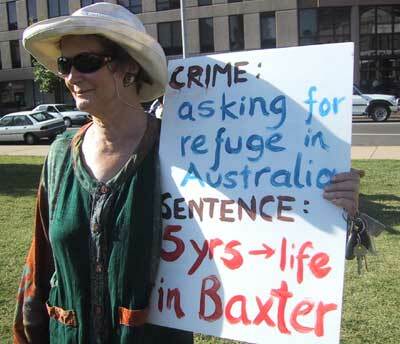 She had made representations to former immigration minister Philip Ruddock about the shortage. Rural Australians for Refugees, which has been pushing for a better deal for the TPV holders, will meet for a national conference in Albury this weekend. It plans to set up a regional TPV employers taskforce. The fate of more than 100 Afghan refugees living in Griffith, Leeton and Young in southern New South Wales hangs on the outcome of a United Nations report. Member for Riverina Kay Hull has approached the Immigration Minister, Senator Amanda Vanstone, seeking an amnesty for the refugees to give them permanent residency and help address the region's labour shortage. But a spokesman for Senator Vanstone says the minister cannot make a decision about the future of the Afghanis until she has received a United Nations (UN) report. The report from the UN High Commission for Refugees will set out what is happening in Afghanistan and whether it is safe to return. The report is due out soon. Ms Vanstone's spokesman says no Afghan refugees in Australia on three year visas have been forced to return home, although some have done so voluntarily.